Last night at Brampton church Norfolk archaeologist, Alice Lyons, delivered a detailed and enlightening talk upon the Roman history of the village. Or, more specifically, the Roman town which originally lay to the south of the current settlement. A site of both pottery and leather manufacture at a scale unmatched anywhere else in Roman Britain. A site of 150 permanent pottery kilns at Brampton at a time when a 20 kiln site would have been considered big. Busy wharves loading shallow drafted coastal shipping, a stone built bathhouse in an otherwise timber built town. A key communication hub with access to the sea and to major arterial routes. Altogether a contrast to the modern village – how times change. Alice rounded off the talk by showing some fine examples of Dr Knowles’, and others, finds from the 1970s excavations. These come from those which are held collection in the Norwich Castle museum. She followed this by identifying pottery shards found locally. It was generally agreed that if ever the chance to publish the Knowles archives at the museum, it should be grasped. Perhaps a project for Crowd-funding. Last Saturday lunch time the Combine Harvester arrived in the village in order to cut the wheat on the 26 acre Town Field. By eight o’clock that evening, not only had the crop had been fully harvested but the straw had been completely baled. All done in roughly 6 hours. By my calculation the wheat crop would produce enough flour on that one field to produce 210,000 large loaves of bread. Incidentally, a quantity which would only be sufficient for 4 minutes worth of the national demand for bread (roughly 12 million loaves per day). This made me think. At the outbreak if the First World War, crop yields were less than a quarter of those which are attained now. In fact, the yield was probably only enough to provide for 53,000 large loaves. It would have taken nearly three days to harvest the wheat on that same field, and then only if they had the benefit of a modern reaper/binder. Before such machinery was available, three experienced farm workers, along with their families to help gather the sheaves and “shock” the crop would take nearly three weeks to cut the wheat. In all likelihood more than three worker’s families from the village would be involved. No wonder harvest was such an important event. An event which now is limited to a Saturday afternoon. A sad comparison in so many ways, but at least we have enough to eat. A giant fell this morning. The skeletal carcass of the last English Elm to have reached maturity in the village has been brought crashing to ground. 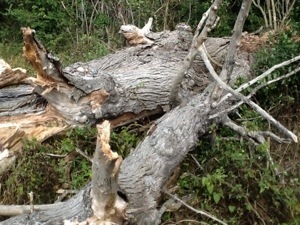 It had far outlasted its contemporaries – many of which were felled when the Dutch Elm Disease struck in the 1970’s – but now decay had finally so-weakened the stem that it was unlikely to remain standing for a further winter. So, at ten minutes to ten on a Sunday morning, following a short chainsaw cut and a haul on a tractor winch, the old tree cracked and came to earth. What was left of its crown, which once touched up to 100 feet in height, split in to many pieces on impact. Tell tale star-like shadows of fungal growth showed through where the viable bark had spilt away. These are the marks of its death and decay. The stump looks as weak as cork. There is a gap in the skyline. Some ten years ago tree surgeons had taken cuttings from its then fully leaved crown in the hope that it was disease resistant. But the cuttings came to nothing and the disease took hold. Now this is its epitaph. It’s young relations, mostly clones of the parent, still sporadically grow as hedge plants for a few years until the Dutch Elm gets to them. No Elm in the parish reached maturity in recent years. The bare branches remain in hedge lines for a few years until they are tidied away or trimmed back. The Elm is no longer a feature in the local landscape. Although it held on for longer than most in the area. Local legend has is that a scattering of Portuguese Gold Reals rained from the royal coach as it approached Oxnead. The workmen who surrounded the newly repaired bridge scrambled in the Bure to recover the coins as a memento. For weeks and perhaps months they had sweated over building works at Oxnead Hall. In a throwback to the regal progresses of Elizabeth I, the Lord of the Manor Sir Robert Paston had committed his fortune and more besides to a banqueting hall fit for a King. But it was the narrowness of the new bridge which allowed the locals to get close to their sovereign. 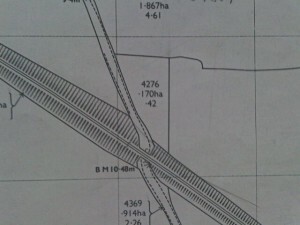 The actual extent of the plough lands can be roughly estimated today from a large scale OS map as long as you adopt some basic rules. 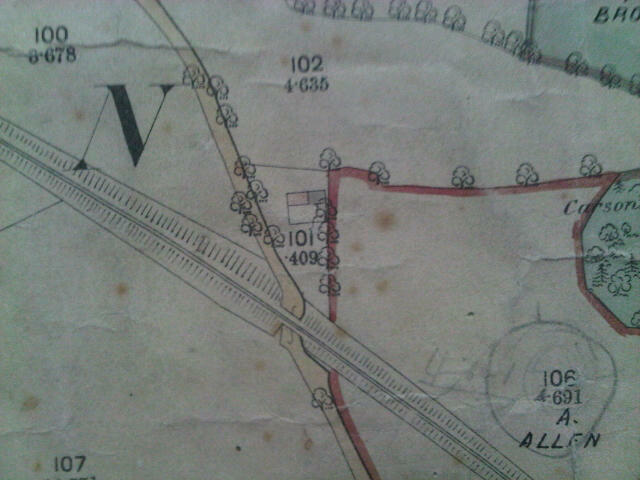 For example, start near the Church as the assumed centre of the village; assume that the modern roads follow ancient routes; ignore the Victorian railway line and trust the line shown as the Parish boundary. If we use the known field names encompassing Hall and Street Farms the area coincides with those known as Church Field, Seven Acres, Kiln Field, Hill Field, Winter Letts, Topletts and the Town Field. 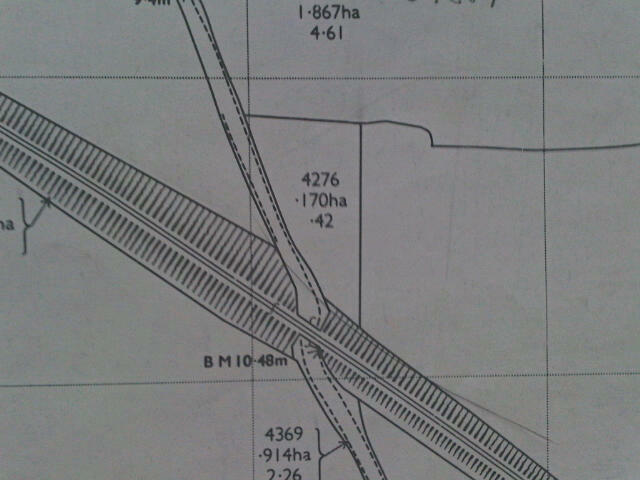 It is a very neat fit and 150 acres looms out of the plan. Strong winds on Wednesday almost erased another little-noticed piece of Brampton’s history. An apple tree, rotten of trunk and with no crown to speak of, displays what must be a terminal split. Structurally unsound, but still just standing, it seems unlikely that it will survive for much longer. It’s significance being that it’s origins seem likely to be domestic; planted at the end of a garden or small holding in an area which seems today to be just farmland. I mentioned the site in an earlier piece (6th November 2011) and I have yet to establish the real recent history of this site. The ancient history of the site is much easier to identify. For the old apple tree marks the edge of ancient track which leads to what seems to have been a wharf or loading area on the original shore of the Bure. This was not the Bure as we know now, but the Roman waterway, bustling with shallow drafted sailing vessels collecting the amphorae and other pottery from the nearby industrial town with its many kiln. Within yards the astute observer can cast from the site of a rural dwelling of the nineteenth century to the fourth century AD. I drive past the ghost of a garden every week day. To the left of the Buxton Road just before the bridge, an apple tree clings on to existence on an old hedge line. This is the only mark which remains of a dwelling or smallholding. 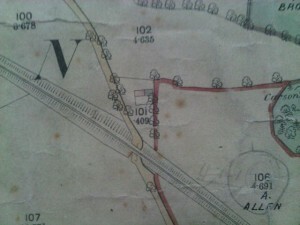 Upon checking the old maps of the area, the site was clearly occupied as a smallholding when the tithe map of 1837 was produced. By 1885, when the surveyors of the Ordnance Survey were gathering their records, the smallholding seems to have had a dwelling added to it. The map shows a typical part cottage / part barn of the type that you can still detect in some of the older village houses. It was only marginally affected by the arrival of the railway line in the 1880’s, although the upheaval must have been enormous. Did the cottage become abandoned then or much later? By 1946 an aerial photo was taken covering the Parish and the enlarged image, although slightly blurred, appears to show the area being cultivated like an allotment. Perhaps by then the house had been abandoned but the separate smallholding continued.